For me, it takes a Green Village. Who can ID you in the I.D.? If you’re like most people, you find a restaurant you like and stick with it, returning again and again over the years and praying it never closes. 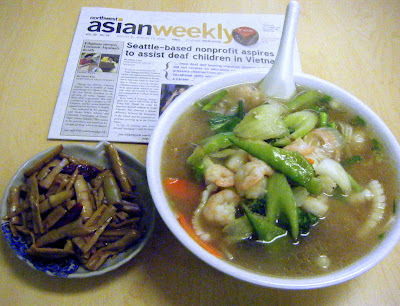 For a time Green Village in Seattle’s Chinatown International District, known for Chinese-American favorites like green pepper beef, fried rice and chow mein (as well as my “go-to” dishes, cold bamboo shoots and seafood noodle soup) was that place for me. These days you’re more likely to find me seeking out other cheap eateries within a stone’s throw of the place, like Hing Loon (where I’m crazy about the sui kau noodles and the smoked duck) and Samurai Noodle (where the thick slices of roast pork in the Samurai Armor Bowl regularly put me over the edge). But on a recent Saturday, when the line at Samurai was way too long (again!) I returned to Green Village — reopened in December after a lengthy closure. 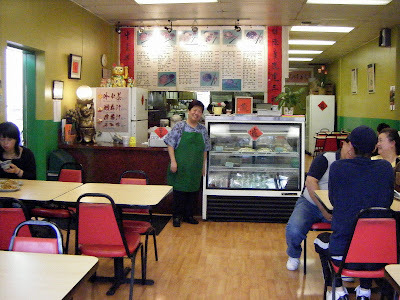 And standing there, as always, ready to greet me warmly was proprietor Wendy Lu. Wendy Lu, back where she belongs. And that makes two of us. It was deja vu all over again as Wendy shouted, “Nancy! Where have you been?” — before ringing up my standing order. Yes, it’s been a few years since I’d been to Green Village, but Wendy — who’s been working at one restaurant or the other in the I.D. since 1979 — knew exactly what I wanted to eat. And even if you’ve never sung her praises in print, I’ll bet you a dish of bamboo shoots that if you’re a regular here, she knows your standing order too. I was saddened to hear the reason why her cafe had been closed. Wendy’s eldest son had been sick with cancer. Diagnosed when he was a teen, it took his life in 2007 and, said Wendy, she’d just been too sick with the loss to carry on at Green Village, where she takes orders as fluently in English as she does in Mandarin and Cantonese. And as sad as I was to hear of her loss, I was very happy to be back in her orbit. Do I prefer the soup noodles at Hing Loon? Yes, I do. And as much as I adore those bamboo shoots, I’d throw ’em over in a minute for Samurai’s tender pork and ramen. But there’s no denying that being one of Wendy Lu’s “regulars” is part of what will continue to draw me back to Green Village, open Mondays through Saturdays from 11 a.m. to 5 p.m. So tell me, where in the I.D. would they call you a “regular”? And what do you eat when you’re there?